Corn on the cob is one of our favorite summer dishes, but what better way to bump things up a notch than to wrap our corn in bacon, and stuff it with fresh basil and jalapeños?? You might think that butter is all you need to make your corn shine, but trust us, all these flavors work perfectly with the sweet corn and turn this yummy veggie into something amazing. For a cook-out on an evening when you’re not afraid to get a little messy, this recipe will rock your world – try it out and see for yourself! In a small bowl, whisk lime juice and zest into crema, and season to taste with sea salt. For the corn: preheat oven to 350º F.
Lay out 6-7 slices of bacon on a large piece of plastic wrap, overlapping them slightly, until you’ve made a rectangle that is as long as an ear of corn. Cover bacon with another layer of plastic wrap, and lightly pound it with a heavy object (meat mallet, rolling pin or skillet, etc.) until flattened and pressed together. Remove plastic wrap and set aside. Sprinkle bacon with chopped basil and jalapeño, then lay 1 ear corn horizontally along the edge of bacon closest to you and roll it, wrapping the bacon along with it, away from yourself. Transfer corn (seam side down) to a baking rack. 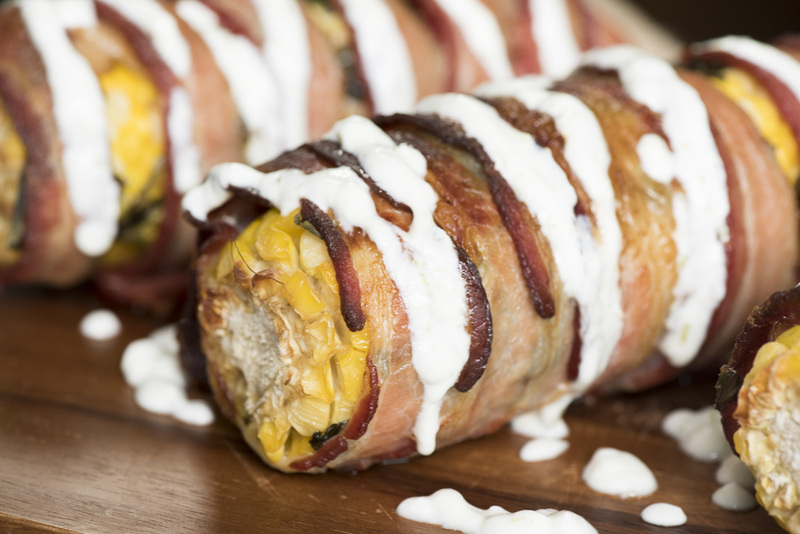 Once you’ve wrapped all your corn in bacon, place baking rack in oven (with an aluminum foil-lined baking sheet on the lower shelf to catch the drippings) and bake for 25-30 minutes, or until bacon is crispy and corn is cooked through. Remove from oven and let cool 5 minutes before serving, garnished with lime crema.